Companies can get slammed with hundreds of resumes for every job listing they post, so it's tempting to let the polite, caring touches go by the wayside. However, applicants that take the time to apply and possibly interview for a job deserve to be thanked. They deserve your cordial communication at each step of the recruitment process, including being rejected. Your company's reputation is built one candidate at a time, and how you treat job applicants is crucial for your success in recruiting future talent. If an applicant, who possesses rare skills has to chose between two employment offers, he or she may likely select the organization that has the better reputation as an employer of choice. In this day of social and professional networks, such as Facebook, LinkedIn and Twitter, it's difficult for an employer to hide. Salaries are regularly compared online and candidates can check out your reputation as an employer by reading employee reviews on sites such as Glassdoor. Job applicants make decisions about you as an employer based on your actions. Treating all applicants with respect and consideration can attract much-needed talent and make you an employer of choice. 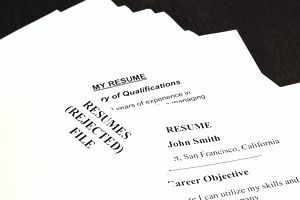 Start with the applicant’s address from his or her resume, as you would with any formal business letter if you plan to mail the rejection letter. In an email, your approach may be more informal. Use a standard salutation, such as Dear John. Example: "We appreciate your interest in our company and the time you spent with our interview team." Example: "Thank you for taking the time to apply for our (name of position) job opening." The second paragraph of the letter should state the reason for the rejection. This statement should be carefully crafted so it is not misinterpreted or used as a basis for future legal action. Discrimination in any aspect of the employment relationship from recruitment to the end of employment can be the basis for legal action. Also, do not state that you found another more qualified candidate. Lawyers warn that in order to make a comparison, candidates could request to assess the qualifications of others applying for the same job. In addition, you don't want to spend hours fulfilling subpoenas and filing court documents, nor exposing your recruitment process to unnecessary scrutiny. Use the final paragraph or two of the rejection letter to list next steps, encourage the applicant to apply in the future, or simply, cordially sign off. When rejecting an applicant before an interview, thank the applicant for his or her interest in your company. Example: "Once again, thank you for taking the time to send your resume and cover letter for consideration for our position of (name of job). You have not been selected for an interview at this time." Example: "Once again, thank you for coming in for the interview. We enjoyed meeting you and learning about your experience and interests. While you were not selected for this position, we encourage you to apply again in the future for openings that match your qualifications." Sign the rejection letter. The hiring manager, the company owner in a small business, or the Human Resources staff person working on recruitment should sign the rejection letter and provide their title and contact information. If you use a team to interview employees, especially after team members met the applicant, the signature can say on behalf of the interview team. Use this rejection letter template to formulate your rejection letters at each stage of the recruitment process. Your applicants will appreciate your thoughtfulness and you will build your reputation as an employer of choice.